Throughout the year, the SLO Chamber advocates on behalf of businesses and the community as a whole with the belief that a beautiful, diverse and open community creates enriched lives for happy residents and therefore, successful businesses. New and emerging industries and trends in events focusing on housing, cannabis, energy and more. Employment law attorney Susan Waag dives deep into recent legislation generated by the #MeToo movement. Specifically, she discusses appointing women to boards of directors and training all supervisory positions in preventing sexual harassment in the workplace. 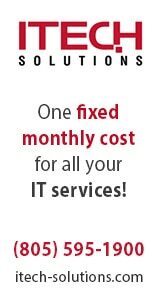 Waag also addresses overtime pay for computer software employees. Employment law attorney Susan Waag shares new forms that are required prior to hiring and stresses the importance of written offer letters during the hiring process. Specifically, she discusses how these documents can be used to address particular conditions of employment, such as background checks and criminal history. Employment law attorney Susan Waag provides specifics regarding: criminal history do’s and don’ts; Department of Labor pilot programs related to federal and state law; contracts and documentation when working with subcontractors; and also an updated drug test and family medical leave form in California. The California minimum wage has gone up. Employment law attorney Susan Waag shares how employers in San Luis Obispo can execute proper pay practices that are compliant with the new laws regarding minimum wage and exempt minimum salary. California is in the process of updating legislation regarding overtime, bonuses and breaks. Employment law attorney Susan Waag highlights significant changes and how employers can correctly calculate the exact bonus rate for pay each employee. Because the National Discrimination Policy in California has been expanded to cover perceptions, physical characteristics and names, employment law attorney Susan Waag discusses how to avoid referencing national origins in evaluating potential employee skill levels. Because of the #MeToo movement, harassment cases in the workforce are now taken more seriously. 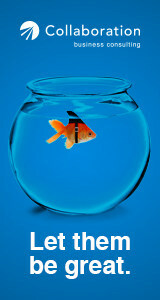 Employment law attorney Susan Waag also discusses settling arbitration in California. “Parental leave is a job protected leave,” said employment law attorney Susan Waag. In this excerpt, Waag details the do’s and don’ts of parental leave and family time-off. Employment law attorney Susan Waag provides tips on how to manage immigration inspections issues and review of immigration status paperwork. Waag also discusses required training for spotting human trafficking in the hospitality industry. On December 13, 2018, SLO Chamber members received a legislative update from Senator Bill Monning, Senate Majority Leader of the 17th District. Event highlights included Senator Monning providing a recap of 2018 celebrating both successes and areas to improve in 2019, ways in which he sees government and business working together to address climate change, the challenges surrounding foster care and mental health, the various factors that contribute to California’s devastating and deadly fires and recent improvements that have been made regarding our state’s mammoth pension crisis. Senator Bill Monning provides an overview of 2018. The Senate Majority Leader addresses shifts in the budget, fire protection and prevention challenges, passage of SB 1090, and proposed next steps for SB 968. Senate Majority Leader Bill Monning dives deeper into budget shifts affecting transportation and infrastructure. He explains how the passing of locally supported SB 1129 will truly make a difference. Looking ahead, Monning discusses the need for bipartisan collaboration. “It’s human-caused, so there’s a human solution,” states Senator Bill Monning. 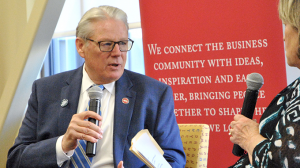 During the Chamber’s Legislative Lunch in December, Monning shared ways in which government and business can work together to address climate change. Senator Bill Monning discusses some of the barriers to effective care faced by the children’s foster care and mental health services. Monning details the human need as well as his own frustrations regarding legislative attention and fiscal relief. What to Do About Fires? Senator Bill Monning explains the complex public pension system and breaks down how the system is in crisis. In addition to outlining recent improvements, he provides insight into changes still needed. This year’s State of the State event event brought together three Sacramento insiders for a wide-ranging conversation on state politics — from primary results and the Times Up movement to the future of the GOP in California — moderated by Sam Blakeslee, a former state legislator who founded and now runs the Institute for Advanced Technology & Public Policy at Cal Poly. At the SLO Chamber’s 2018 State of the State, Amy Brown, John Myers and Cassandra Pye discuss the impact of the #MeToo movement in Sacramento and the open letter signed by more than 140 legislators, lobbyists and political consultants calling out the pervasive culture of sexual harassment. Cassandra Pye, Amy Brown and John Myers highlight some of California’s must watch races and most interesting ballot measures for the November 2018 election at the SLO Chamber’s 2018 State of the State. Cassandra Pye and Amy Brown discuss recent efforts to support centrist candidates with money and messaging at the SLO Chamber’s 2018 State of the State. 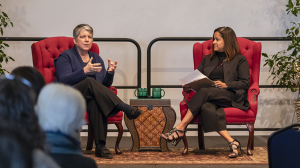 In a conversation with Ermina Karim on April 30, 2018, Janet Napolitano shared stories from a life dedicated to public service, assessments of where we stand today and insights into the UC system. UC President Janet Napolitano talks the cost of college education in a sit-down with the SLO Chamber. UC President Janet Napolitano ticks off the key iniaitives she’s shepherding, including becoming carbon-neutral, increasing transfers and supporting undocuments students, in a sit-down with the SLO Chamber. Former Homeland Security Secretary Janet Napolitano shares the story behind the creation of the DACA program to help undocumented students and others brought to the United States as children in a sit-down with the SLO Chamber. Former Homeland Security Secretary and current UC President Janet Napolitano talks about defending the future of the program she created in a sit-down with the SLO Chamber. Janet Napolitano talks about her approach in leading large complex organizations through diverse positions such as governor of Arizona, Homeland Security secretary and president of the University of California system in a sit-down with the SLO Chamber. US President Janet Napolitano shares the challenges and approaches to promoting diversity in UC’s student population in a sit-down with the SLO Chamber. UC President Janet Napolitano addresses why the university system recently opened the National Center for Free Speech and Civic Engagement in a sit-down with the SLO Chamber. Such collaborative and creative approaches were the focus of the 2018 San Luis Obispo County Housing Summit, “Gaining Momentum: Reflection and Envisioning the Future.” The half-day session on March 22 built upon last year’s inaugural housing summit, with both events bringing together top minds from around the region and state to explore solutions to San Luis Obispo’s housing challenges. View photos from the event, here. Sonja Trauss – named to the Politico 50 – is a pioneer in the YIMBY movement, working to drive housing prices lower by building more and inspiring similar movements elsewhere. In addition to co-founding the YIMBY Party, she founded the San Francisco Bay Area Renters Federation and a legal advocacy and education fund to help enforce state housing laws. Sonja shares with us how she discovered her passion for advocacy and how you can get involved too. As the newest City Manager on the Central Coast, Scott Collins brings to the City of Morro Bay and the region experience from his former leadership positions in the administrative offices of the City of Santa Cruz, CA and Boulder, CO. From overseeing major departments like public works to facilitating budget decision-making processes that strengthen links between community priorities and limited revenues, from managing complex projects to connecting residents and businesses with their local officials in ways that increase support for the City organization. Scott Collins shares with us what Morro Bay is looking at for vacation rentals and granny units. As County Administrative Officer, Wade Horton oversees the County’s finances and 2,800 staff that provides a wide range of services to the San Luis Obispo County community, including public safety and emergency preparation, road maintenance, environmental protection, health and human services, and more. Wade brings 19 years of combined public and private sector experience. Prior to his role as County Administrative Office, Wade served as the Director of Public Works for the County of San Luis Obispo. Wade shares with us what the future of regionalism looks like. Bianca Koeing’s experience is drawn from a wide variety of local and international projects, with a special emphasis on green infrastructure and memorable design experiences. She excels in highly collaborative, fast-paced environments to efficiently deliver engaging landscapes. Bianca brings a comprehensive approach to the design and construction process, from thorough analysis of site opportunities and constraints, to clear communication of project goals, vision and budget. Bianca shares with us what she believes is the future of placemaking looks like. Matthew Bronson, is the City manager of Grover Beach, CA whose responsibilities include management of finances, budgeting, city staff and enforcement of city laws and ordinances. Prior to moving to the Central Coast to serve as the Administrative head, Matt served as the assistant city manager for the city of San mateo from 2010-2016. During his time with the city, he also served as interim community development director and interim public works streets and facilities manager. Matthew Bronson shares with us what he believes will be the building technology of the future. Each new year brings with it resolutions, a fresh start and new laws that impact workplaces of all sizes. Employment law attorney Susan Waag of LightGabler presented an informative legal update for small business owners, HR professionals, new managers and everything in between. She helped the SLO Chamber members navigate complex and potentially confusing legislation including the fair pay act. Each new year brings with it resolutions, a fresh start and new laws that impact workplaces of all sizes. Employment law attorney Susan Waag of LightGabler presented an informative legal update for small business owners, HR professionals, new managers and everything in between. She helped the SLO Chamber members navigate complex and potentially confusing legislation including investigating harassment claims. On May 5, 2017, the 2017 State of the State brought policy experts, a journalist, a seasoned as well as a freshman politician to San Luis Obispo to talk about the American Health Care Act’s impact on Medi-Cal, immigration by executive order, single-payer systems, political tension in Sacramento, and why elections really do matter. “I know all of you know after this election cycle, no matter who you voted for, that elections matter. I think that was something that was a real takeaway, and I think it is actually a teachable lesson out of the election cycle. Elections matter. Your vote matters.” – John Myers, Sacramento bureau chief, Los Angeles Times, at the 2017 State of the State in San Luis Obispo. “One out of three Californians, think about this, one out of three Californians are enrolled in the Medi-Cal program. That’s a phenomenal number of people. We have had a 5,000,000-person surge in Medi-Cal enrollment in three years. That is financed in large part by the federal government, by the Affordable Care Act’s provisions.” – John Myers, Sacramento bureau chief, Los Angeles Times, at the 2017 State of the State in San Luis Obispo. “You want the people’s representatives in Congress that can weigh policy, bring in experts, study things, and then you want it going through a more deliberative process. Otherwise you see a lot of dislocation.” – Jordan Cunningham, assemblyman, R-Templeton, at the 2017 State of the State in San Luis Obispo. “I always get a kick out of this conversation because California has two single-payer systems.” – David Crane, Govern For California, at the 2017 State of the State in San Luis Obispo. “What most Californians don’t know, 70 percent of every bill that makes it through both Houses, Assembly and the Senate, to the Governor’s desk, for his consideration, have bipartisan support.” – Bill Monning, senator, D-Carmel, at the 2017 State of the State in San Luis Obispo. On Feb. 9, 2017, we hosted the 2017 Employment Law Update, breaking down some of the major legislation affecting small businesses in San Luis Obispo and across California. “What it really amounts to is you should be doing some sort of audit of your pay structure based on, I hate to say it, gender, race and ethnicity.” – Susan Waag, at the San Luis Obispo Chamber of Commerce’s 2017 Employment Law Update. On Feb. 9, 2017, the San Luis Obispo Chamber of Commerce hosted the 2017 Employment Law Update with employment attorneys Jonathan Fraser Light and Susan Waag of LightGabler. “If you have an employee whose got their own cell phone that they use for work, you are going to have to have some reasonable reimbursement for the employees use of that cell phone. And that goes for other devices as well.” – Susan Waag, at the San Luis Obispo Chamber of Commerce’s 2017 Employment Law Update. “if you have a 10 hour and 15-minute workday, not including meals, but if actually work 10 hours and 15 minutes, that’s three rest breaks. Four hours. Four hours. Then two hours and 15 minutes. Is three rest breaks. So, you’ve got to remember that, or any major fraction language.” – Jonathan Fraser Light, at the San Luis Obispo Chamber of Commerce’s 2017 Employment Law Update. “One-person, or one-user bathroom, it has to be marked with signage that is gender neutral.”– Susan Waag, at the San Luis Obispo Chamber of Commerce’s 2017 Employment Law Update. “…That’s going to be travel time that you are not only going to have to pay mileage if they are driving their own vehicle but also the travel at an hourly rate.” – Jonathan Fraser Light, at the San Luis Obispo Chamber of Commerce’s 2017 Employment Law Update. “If you’ve got 26 or more employees it went up to $10.50 on January 1. If you have under that amount it will go up to $10.50 next year…You can see we’ll be heading up to $15 an hour at some point and that obviously creates a ripple effect for your employees who are just above minimum wage now, when you bump the lowest people up another notch you’ll have to bump the people above them to be fair.” – Jonathan Fraser Light, at the San Luis Obispo Chamber of Commerce’s 2017 Employment Law Update. “If I’m paying by the piece, let’s say it’s minimum wage, we’re paying $11 an hour, but on a good day of blueberries they can make $17 an hour. That piece rate does not cover the rest breaks. Now you owe for two rest breaks a day, five days a week, 10 rest breaks, that’s an hour and 40 minutes’ worth of rest breaks, you now have to pay that separately from your piece rate…Specifically by law now you have to pay those rest breaks at whatever you were making that week. $17 this week, next week it rained, we didn’t have a good week it’s $13 an hour.” – Jonathan Fraser Light, at the San Luis Obispo Chamber of Commerce’s 2017 Employment Law Update. “You cannot have a policy that says anybody who has a work-related injury is going to be drug tested.” – Susan Waag, at the San Luis Obispo Chamber of Commerce’s 2017 Employment Law Update. “It’s not now that people can go smoke at lunch or they can come in high… Here is the way it’s going to work. Not much has changed really at all. Applicant comes in and says I’m not going to pass your test I have a compassionate use card. That doesn’t mean that they get to work for you, that means now you have to switch over to a reasonable accommodation discussion with this applicant.” – Jonathan Fraser Light, at the San Luis Obispo Chamber of Commerce’s 2017 Employment Law Update. 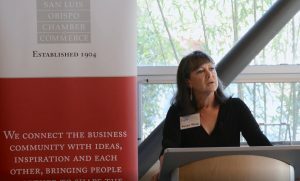 “There was a clarification that came out in October on how you can pay sick leave for people who are on commission or any other wage system where their pay may vary from week to week, or hour to hour.” – Susan Waag, at the San Luis Obispo Chamber of Commerce’s 2017 Employment Law Update. “You cannot use prior salary history, by itself, to affect what their wage is going to be.” – Jonathan Fraser Light, at the San Luis Obispo Chamber of Commerce’s 2017 Employment Law Update. 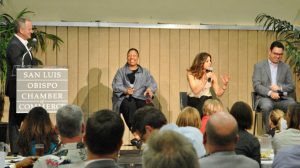 On Friday April 29, 2016 the San Luis Obispo Chamber of Commerce put three of the state’s top minds in front of 250 business leaders to clarify and dig deeper into these and other statewide topics. California State Treasurer John Chiang, Will Kempton, executive director of Transportation California and John Myers, Sacramento bureau chief for the LA Times discussed unfunded pension liabilities and Californians deciding how important they find public safety employees, transportation issues in California and the deteriorating system, why San Luis Obispo County should become a Self-Help County, housing issues, public employees healthcare liabilities, how the public needs a better understanding of their government, high speed rail and election predictions. On Tuesday March 29, 2016 the San Luis Obispo Chamber of Commerce hosted the annual Green Business Symposium. The SLO Chamber brought together Matthew Woods, senior vice president of partners at Sunrun, Ron Cogan, editor and publisher of the Green Car Journal, and William Toman leader of the CalWave program. They discussed: the importance of making everything in your life more energy efficient and reducing the need for more energy, changing driving habits and making lifestyle and work changes to cut down on carbon emissions and climate action at a local level. On September 22, 2015, the San Luis Obispo Chamber of Commerce brought together three of the leading minds in cybersecurity to talk not only about the importance of protecting your company or nonprofit’s data from hackers but how to change the culture within the organization to ensure the safety of your most important information. Bill Britton, director of the Cal Poly Cybersecurity Center, Michael Hanson, vice president of I.T. Security at MINDBODY and Thomas Lebens, partner at Fitch, Even, Tabin & Flannery LLP joined moderator Amy Kardel, director of Clever Ducks to discuss implementable strategies for small businesses to consider and execute to help further protect themselves. On May 1, 2015 the San Luis Obispo Chamber of Commerce hosted the annual State of the State with Former Mayor of San Jose Chuck Reed, Dr. Newsha K. Ajami, director of Urban Water Policy with Stanford University’s Water in the West project and California State Senator, Bill Monning. They discussed why earned pension of current retirees should not be reduced, the balance between water conservation and the need for more housing, pension reform, the cost benefit of fracking, desalination and building a Colorado Water Pipeline, the impact the drought has, and will continue to have on the natural ecosystem of California and what needs to be done to help offset the changes, and CEQA reforms. On March 28, the San Luis Obispo Chamber of Commerce brought three of California’s top minds to San Luis Obispo for the third annual State of the State. David Crane, president of Govern for California, Bob Linscheid, chair of the CSU Board of Trustees and Paul Helliker, deputy director, California Department of Water Resources discussed: a possible tax increase to pay for pension obligations, the pay for the newly hired presidents in the California State University system, getting kicked off of CALSTRS, pension reform, balancing the endangered species act with water delivery for agriculture, the effect that climate change is having on California, the future of water in California and more. 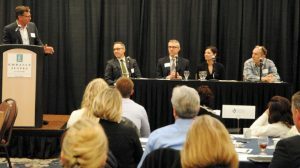 On January 28, the San Luis Obispo Chamber brought two of the top employment law minds in the state to discuss major changes in 2014. Kathy Eppright is the managing principal of Andre, Morris & Buttery and chair of the firm’s Employment Law Practice Group. Dave Juhnke is a partner at the law firm Sinsheimer Juhnke McIvor & Stroh, LLP where he heads up the Litigation Practice Group and handles business and real estate litigation at the trial and appellate levels. This playlist includes six short videos, all two to four minutes long, discussing: the potential issues with allowing employees to use their personal devices, such as phones and computers, for company business, the potential issues with commuting and requiring employees to use personal vehicles for work, the expansion of the California break laws for employees who work outside, minimum wage increases and exempt employee requirements, discrimination in the workplace, protected classes and updates to sexual harassment laws, and AB 263, SB 666 and other updated California Immigration laws.